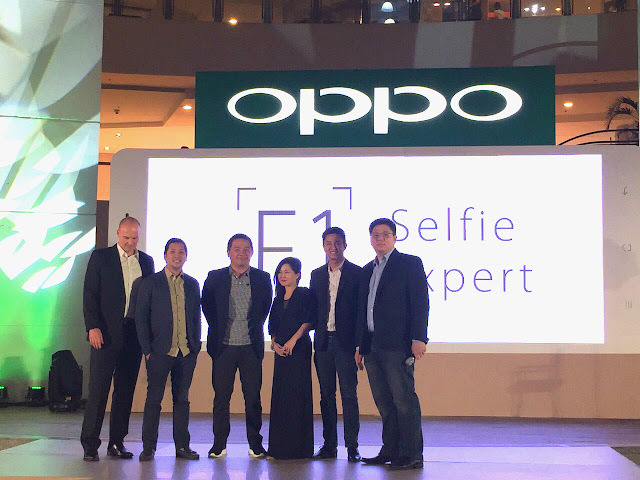 MANILA, Philippines - Global electronics and technology service provider OPPO on Wednesday, February 17, officially launched in the country their first phone of the year, the OPPO F1 dubbed as the "selfie expert." Mr Garrick Hung, Operations Manager of OPPO gives welcome remarks at OPPO F1 launch. OPPO F1 smartphone boasts its 8 megapixels front camera with 84-degree-wide angle camera lens and 0.25-inch sensor that allows 40 percent more light to enter the camera. Ms. Alora Uy Guerrero, OPPO Philippines’ Digital Marketing Manager with Garrick Hung, introduce OPPO F1. As a 'selfie expert' camera, it is packed with Beauty 3.0+ and eight other filters and a display that can double as flash on dim environment. SELFIE Nation! What are you waiting for? F1 is here. Its rear camera has 13-megapixel sensor, f/2.2 aperture lens, Pure Image 2.0+ features and other customization options. The new flagship device is powered by octa-core Qualcomm Snapdragon 616 SoC with four cores clocked at 1.7GHz and four cores at 1.2 GHz, Adreno 204 GPU and 3GB RAM that runs OPPO's ColorOS 2.1.
smoothening of zircon and sand blasting on back cover. OPPO F1 is available in two colors - Gold and Rose Gold. It is priced at Php 11,990 and now available at OPPO concept stores and authorized dealers nationwide. The selfie expert ambassador Sarah Geronimo in TVC reveals OPPO F1 price in the Philippines. OPPO Philippines also announced collaboration with other organizations. Just recently, the company became title sponsor of the 2016 PBA Commissioner's Cup. Its partnership with Home Credit was also sustained for this year to give Filipinos more options to buy F1. From February 19 to March 31 this year, those who have no credit card will have chance to purchase the new selfie phone for as low as Php 1,299 every month for six months at 0 percent interest rate. OPPO Philippines to announce F1 Plus soon. F1 will be available also under Smart's All-In Plan 1200 and on prepaid with free SIM, 50MB free data monthly for six months and Php150 worth of load for every Php 250 accumulated top up per month for six months.